To audit your POEditor account, you can access the Logs section in Account Settings. The Logs section is divided into three sub-sections: Activity Log, API Log and Webhooks Log. 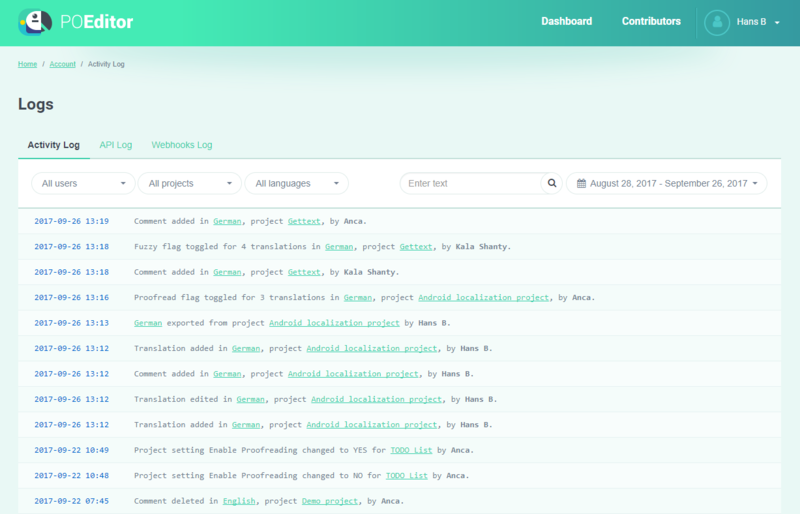 The Activity Log tracks events related to translation, project management, API activity, integrations with code hosting services, settings changes (both project and account settings) and other events relevant to the user. To more easily find the events of interest, use the search bar at the top of the Activity Log page. You can also filter events by user, language and project. We keep most tracked events for 15 days. The ones which have to do with data deletion are kept for 30 days. To check your API activity, go to Account Settings > Logs > API Log. 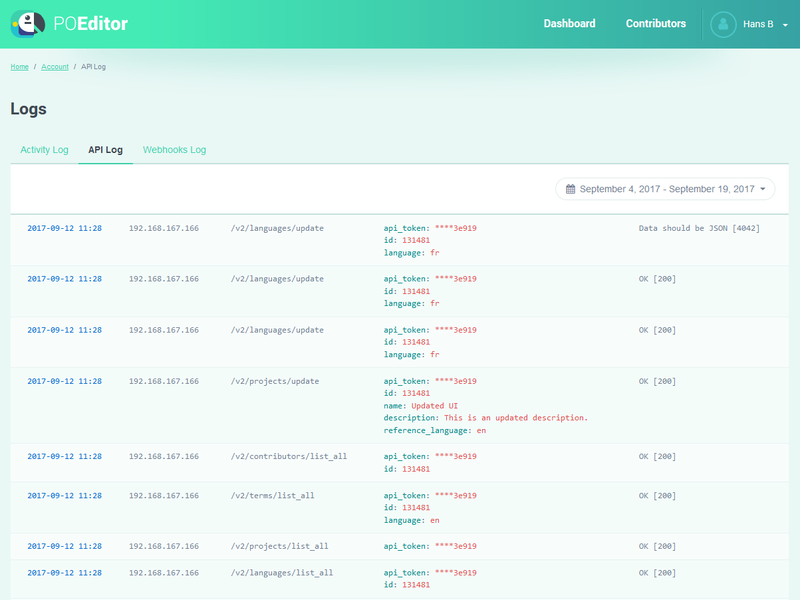 The API Log stores for 15 days all the requests that POEditor can identify as yours (using an API token generated from your account). You can filter the API logs by date, using the date range picker at the top right corner of the page. As a POEditor user, you can see what actions have been triggered in your account using webhooks. For this, go to Account Settings > Logs > Webhooks Log. 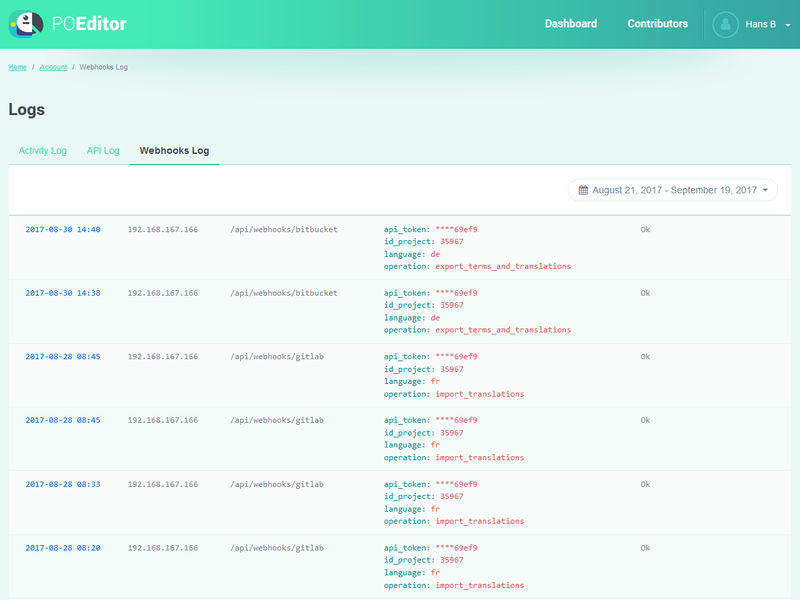 The Webhooks Log stores for 30 days all the requests that POEditor can identify yours (using a webhook generated from your account). To filter the webhook logs by date, use the date range picker at the top right corner of the page. Note: POEditor uses UTC to express the time when an event took place.